Remove selvages. Reason: the selvage has a different stretch rate than the main fabric. 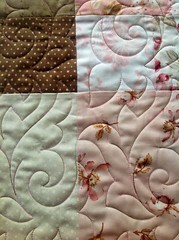 Make a true square or rectangle of both top and backing. 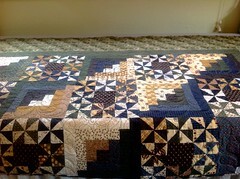 Don’t leave any “stair-step” sides on your quilt – cut them straight. You should have a “perfect” rectangle. Reason: I may use the sides or the top and bottom to attach to my frame depending on the quilting design, and it’s impossible to attach a side that isn’t cut straight across the entire edge. Always make the backing 5 inches larger on all 4 sides. 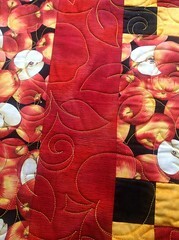 Reason: the top fabric and the backing draw at different rates while quilting. In addition, different fabrics draw at different rates. 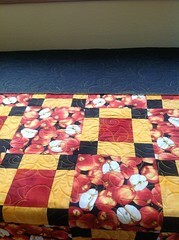 The added 5 inches allows room for this, and allows me to quilt to the edge. 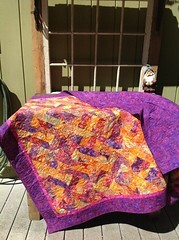 So, you will add at least 10 inches width and at least 10 inches length to the size of your quilt top for the actual backing size. Backstitch all open-edge seams. 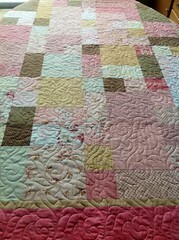 Reason: the quilt top is under some tension as it is being quilted and could come apart if there are insecure outer edge seams. Trim all loose threads. Reason: if during the quilting process the machine foot catches a loose thread, it responds like an emergency brake and could result in a hole in the quilt. 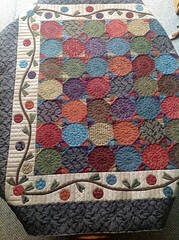 Press the quilt top and backing. When possible, press seam allowances flat. Reason: it makes for a nicer finish and reduces blousing. All seams roll on the machine at a different rate than single layer flat material. Avoid using sheets. Reason: the weave (thread count) is generally too tight to produce decent machine tensions. 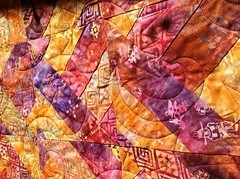 If the perimeter does not have a border, stay-stitching (basting) all the way around the quilt is very helpful. 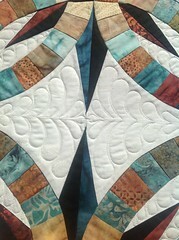 Reason: the outside edge of a pieced quilt top is left unstable and has a tendency to stretch or droop. The basting helps stabilize this looseness. Avoid borders on your backing. 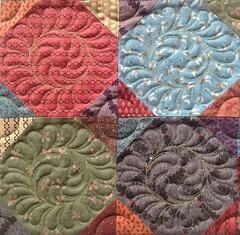 Reason: the top and backing draw at different rates, so during the quilting process, the border on the backing can become asymmetrical on the sides and the quilted top could miss the end border altogether. If extra material is needed to make the backing of sufficient size, place this extra fabric down the center of the backing.